Editor's Note: After playing Sixers during math class, Justin H. ('17) wanted to figure out the best way to play the game. In math class, we played a game called Sixers. In this game, a person has six spaces in a vertical line. A pair of dice is rolled and then the people playing must calculate the product of the numbers shown on the dice. They must then place the number in one of the six spaces. The interesting rule to the game however, is that the numbers in the spaces must be from lowest to highest order. If a person is unable to fit a number in their six spaces in a way that would not violate it going in increasing order from left to right, that person is out. Also if a number appears twice it doesn't count. In this exploration I will attempt to find out a strategic way to best play the game. 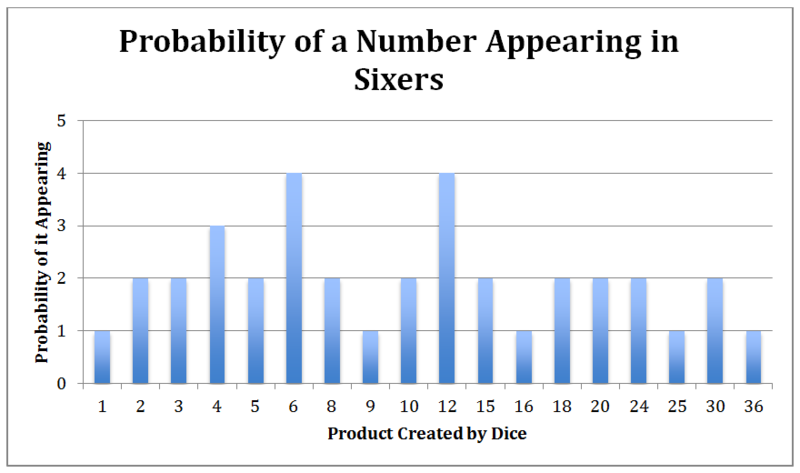 The probability for each number is out of 36, because there are 36 possible outcomes when you roll two dice. Average probability of a number appearing from a roll is exactly 2 out of 36 or 5.555…%. Considering this, all of the above average numbers are between 4 and 12. That is only 1/7 of all the numbers yet there are 2 numbers that have double the average chance of being rolled and one number with a 50% higher than average chance of being rolled. 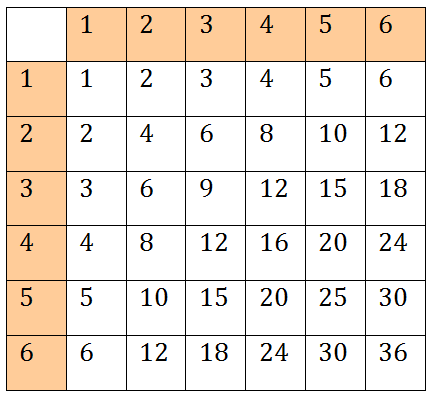 This means that per roll, there is about a 30% chance that either a 4, 6 or 12 will be rolled, and about a 22% chance either a 6 or 12 will be rolled, (11% chance for each). With six rolls occurring it is highly likely that one of these numbers will be rolled. As for numbers with low probability, most of them occur from 16 and up and past 15, there is no number with an above average chance of being rolled. I made another graph that I think provides insight into how the game should be played. Using a stacked bar graph, I stacked in order, the numbers that can be made. This graph also incorporated the amount of times it can occur, so bars are bigger if something has a higher probability of happening. 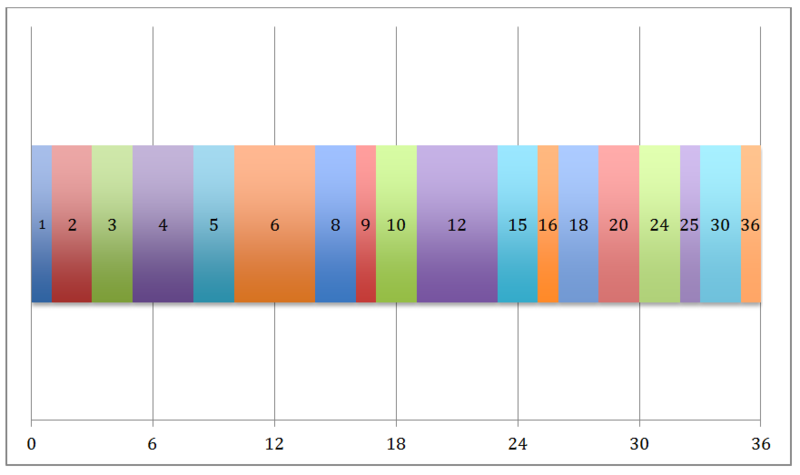 I made 6 tick marks in the bottom of the graph, one for each space that would be in the game. When playing, I will follow where each number is for example, 12 is in the 4th tick mark so it would go in the 4th spot of the board. I started playing the game, following the set of rules I made. If a space a number is supposed to be in is occupied, I would just move it to the next closest space. For the first game I got 5 numbers down with _, 4,9,15,24,30. The next one I got 5 again with 3,_,9,12,15,30. I have noticed that there are certain numbers that are exactly in the middle of the tick marks. For these I have been guessing as to which slot to choose. For 15, I usually pick the 5th slot, as there is a high chance of 12 being rolled. For 6 I usually go in the 2nd slot because there aren't many numbers below that. I played again and again got 5, with _, 5,6,12,20,30. Again, I got 5, with 1,_,10,12,18,36. Then I got only 4 with _,_,8,10,20,36. On my 6th try I won with 5,6,9,18,20,30. I feel like this strategy works and makes sense, as I have been fairly successful to an extent. Part of this game is chance because as the slots fill up the numbers that work get smaller and smaller.